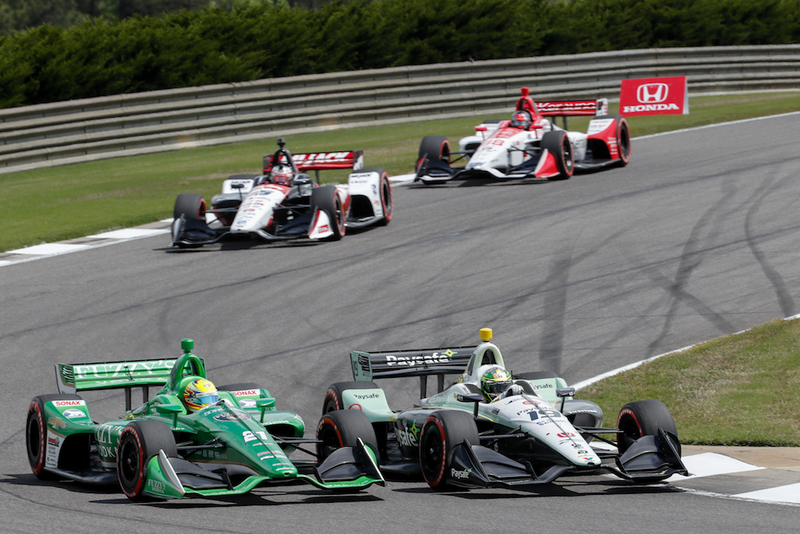 Following a postponement due to inclement weather yesterday evening, the 2018 IndyCar Grand Prix of Alabama restarted this afternoon with much-improved weather and track conditions that allowed Team Penske's Josef Newgarden to cruise to his second victory of the year. The Tenessee native restarted from the lead and managed his race pace as if his Chevrolet-powered IndyCar had a built-in cruise control feature. Newgarden outsmarted and outdrove his competitors, much like he did during his first win at Alabama in 2015, and then in 2017 when he beat his teammates Simon Pagenaud and Helio Castroneves during only his third outing with Penske. "That was more eventful than I would have liked. But everybody did a great job," said Newgarden. "How about Team Chevy today—they gave us a great engine, good fuel mileage, and good reliability, and that's what we needed to win this race. It would seem like smooth sailing for the most part, we didn't have any yellows, which we were hoping no yellows today, but then the rain crept in. I'm glad we made the call to come in so soon." 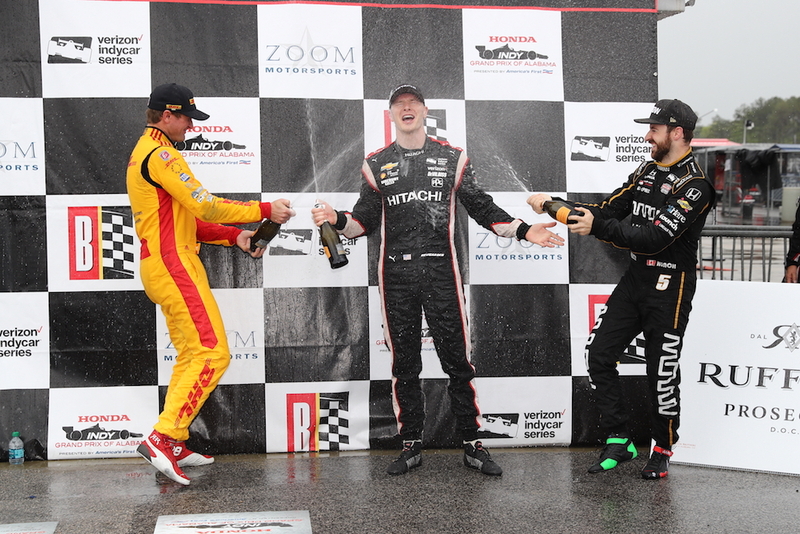 Empowered by a clever pit strategy, Andretti Autosport's Ryan Hunter-Reay made the best of today's conditions and was able to place his DHL-sponsored Honda on the second step of the podium. Had the race lasted about 10 more laps, the American would've caught up and maybe even passed Newgarden who was running on older rubber. 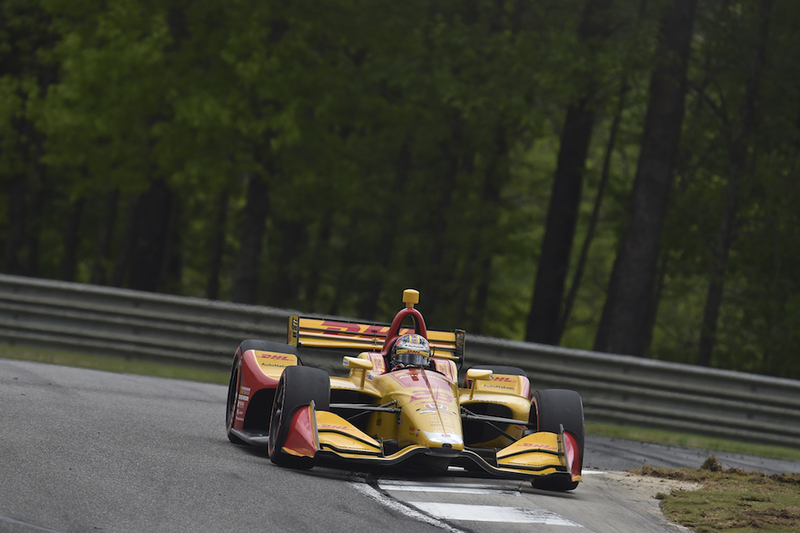 "It was a good race, it was tough getting the fuel number and trying to keep the pace up, but it was a lot of fun when it started raining, trying to find the grip again and searching around," said Hunter-Reay. "I stayed out there as long as I could, but on the slicks, I was a lot quicker and it was that inconsistent snap that you have. 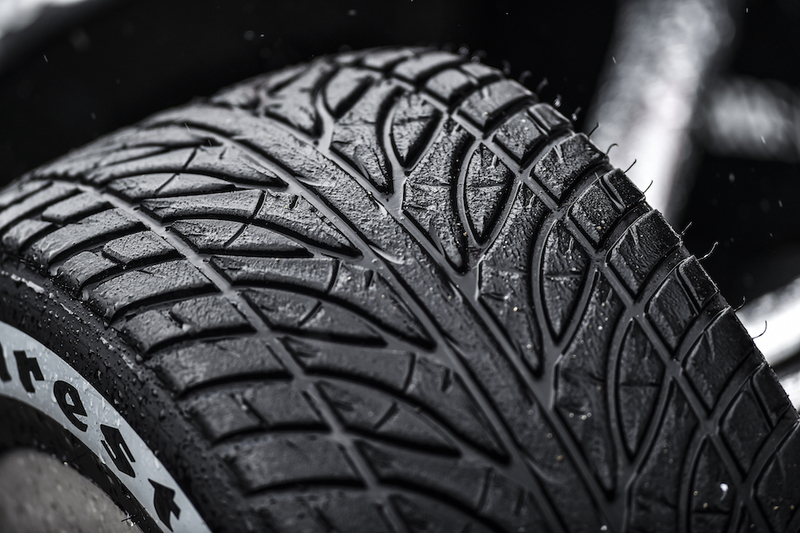 When you have one of those [snaps] with the slicks you can absolutely lose it completely, so we thought that was the best time to come in and grab the Firestone wets. It was good from there. I just needed a little bit more time to cut in on (Josef) Newgarden's lead," he added. 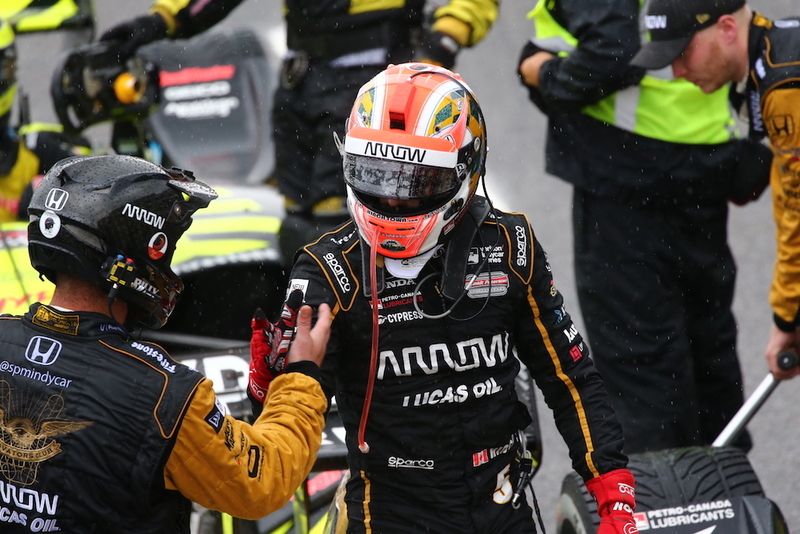 The Mayor of Hinchtown and the man who recently admitted to having peed in his racing suit, James Hinchcliffe, was favored by the racing gods today as he made a valiant charge to the front of the field, ultimately finishing in third place. 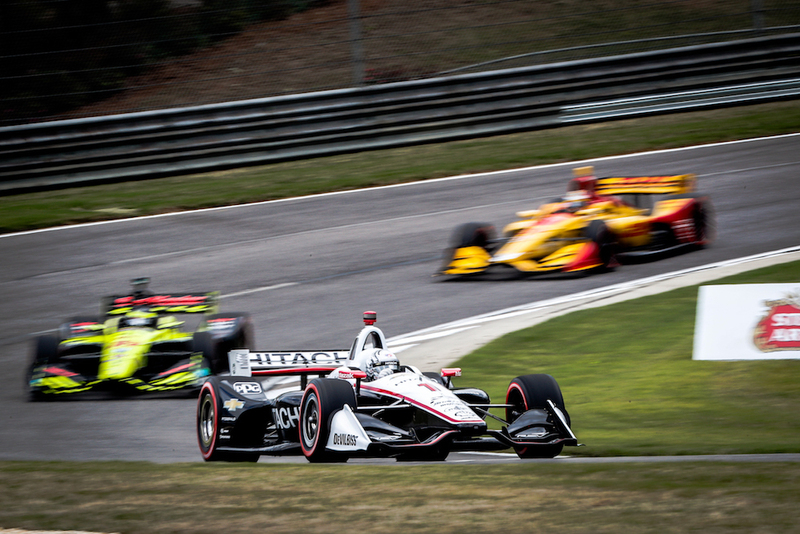 Much like Hunter-Reay, the Canadian was aided by a timely pit stop that saw his teammate Robert Wickens upgraded to fourth place and Dale Coyne Racing's Sebastien Bourdais demoted to fifth. "We were driving around out there, and it's like, 'Right guys its getting wetter, it's getting wetter....' 'Wet enough for rains?' 'Nah, not wet enough for rains...' 'Wet enough for rains?' 'Nah...' 'Pit for rains.' 'Are you guys sure?' It was the right call for sure, so big props to the Schmidt Peterson Motorsports guys; solid weekend for us in the end. As I said before, not a great test here, but two cars in the top-10 after qualifying and then two cars in the top five in the race, so pretty proud of these boys and everyone on the Arrow Electronics car." The IndyCar fraternity now heads to the none other than Indianapolis, Indiana, where it will kick off what it calls the "Fastest Month of the Year," ahead of the Grand Prix of Indy on May 12 and the 2018 Indy 500 on May 27.